"Sharknado" - Mother Jones Hasn't Been This Excited Since "The Day After Tomorrow"
"Sharknado" Is Pure Liberal Propaganda. But Is It Also Scientifically Possible?" went the title of a Mother Jones article before a sensible editor considered the possibility that there might be 5 people in the world who aren't aware that Mother Jones loves liberal propaganda and changed it to the more sensible "Can a "Sharknado" Really Happen?" But why bother to backpedal? It's okay if Mother Jones is honest about their political skew. Aren't they proud of it? Conservatives are always blathering on about how conservative they are while they federally try to control personal behavior the same way liberals do. Wear your bias with pride. "Sharknado" using a sentence like "Global warming IS the reason..." was sure to get progressive hearts pumping like a bunny rabbit on a yerba mate binge. 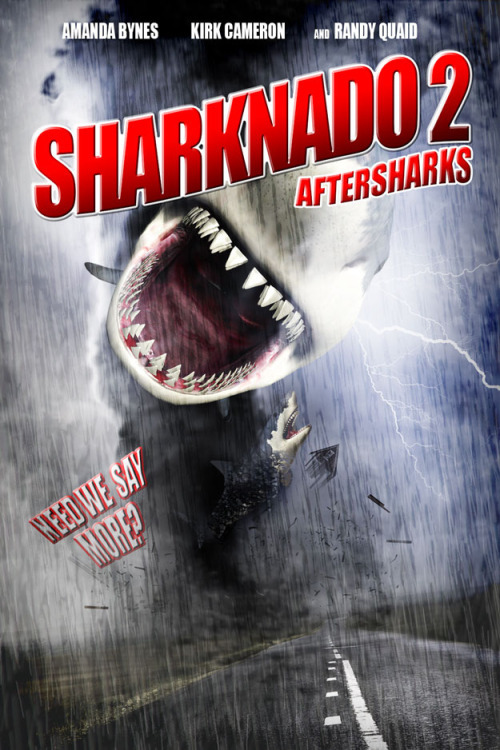 (1) Finally, a made-for-television B-movie on the Sy Fy Channel gets it: the producers must really know their science, because they found a way to blame American cars for a Shark Apocalypse. Let's face it, if you read anything resembling science on Mother Jones it's because you have a disaster wish. You want the world to end because you desperately need to be right and can finally say 'told you so' to James Inhofe or Fox News or whoever Mother Jones is fetishizing in its peculiar way this week. And so you probably do need to have it spelled out for you that sharks are not emerging from a global-warming induced hurricane, it's just a movie. But the publication doesn't want to insult its readers, and the best way to do that is to make the scare mongering in the form of a question, like they do with 'science' articles on biology, natural gas and pharmaceutical companies. And so 'can it really happen?' is the way to go. All it takes is a few emails to get expert context and the article writes itself - and then I get to write about their article just as easily, so everyone wins. Government people love to answer ridiculous questions about this stuff because it makes them look hip. Why do liberals love to look hip while conservatives love to look square? It must be the diverging Democratic and Republican genomes that progressive social psychologists are always trying to prove by surveying college students. I wasn't going to watch the movie because it has Tara Reid in it, and really, I respect her too much to encourage this sort of thing. She is at her funniest when she is doing guest appearances on TMZ, not in 'horror' movies. Seriously, she is hilarious and a terrific sport, if my wife and I had to pick a celebrity to get hammered with, she would be it. In this movie, she doesn't get to be funny at all, though ever since "Army of Darkness" horror scriptwriters have tried to be a little funny - "there's too many of them, we're going to need a bigger chopper" could have been written by the Raimi brothers and Bruce Campbell circa 1992. She's just not mean enough to kill sharks with a shotgun. Even when she's drunk. I never want to cost anyone a paying gig, but they probably should have gotten Lindsay Lohan for a mean role like this. And she needs to be a little mean to get mentioned on Mother Jones un-ironically. Global warming is no laughing matter. If we don't switch to wind energy right now, a large chunk of their audience worries that man-eating sharks could wash up on shore due to a climate change-induced freak storm and eat LA hipsters. It's that serious. But Mother Jones can't really like the movie so after assuring their fellow elites that they are only liking it ironically, with assurances such as that the unintentional laughs "are hernia-inducing", they still un-ironically ask - but could it happen? But, no, Mother Jones readers are assured by government elites, giant, man-eating sharks will not get swept up in the winds of a future Super Storm and land on us. Or could it? We don't know every little ripple that could happen in climate change, they can't prove it can't happen. Well, the rest of us already know that it can't. People are a lot more scientifically literate than they were a decade ago, way back in 2004 when CNN science journalist Miles O'Brien schooled Senator James Inhofe with the awesome science reasoning, “This is the 'Day After Tomorrow' scenario that we're talking about” right after that global warming disaster movie came out. CNN and Mother Jones audience members thought that was a reasonable comparison. That movie was real science, it just hadn't happened yet. O'Brien was an elite bestowing his knowledge on plebeians with some context, he wasn't being literal, they rationalized - just like he had done in 1992 when he reported on the coming ice age. In 2013 we don't need Miles O'Brien to provide context for the science of Hollywood movies - you can just Tweet the presidential handle and ask with hipster tongue-in-cheek-ness if the government is prepared for a Sharknado. You might even get a response. The current administration is pretty hip themselves. But they will blame your shark demise on George W. Bush. (1) And conservative hearts of stone boiling - if they have hearts. (2) Along with somehow changing the approach angle. Global warming can apparently even change the laws of physics, when you write for Business Week or Mother Jones or Think Progress or Huffington Post or...well, there are a lot.